While passing through Cave City, Kentucky in 1938, Chester E. Lewis was impressed by the distinctive design of the original Wigwam Village constructed in 1937 by architect Frank Redford. An astute observer may notice that the Wigwam Village is not composed of wigwams but of teepees. Mr. Redford, who patented the wigwam village design in 1936, disliked the word ‘teepee’ and used ‘wigwam’ instead. Mr. Lewis purchased copies of the plans and the right to use the Wigwam Village name. The purchase included a royalty agreement in which Mr. Lewis would install coin operated radios, and every dime inserted for 30 minutes of play would be sent to Mr. Redford as payment. Seven Wigwam Villages were constructed between 1936 and the 1950s. Finished in 1950, Mr. Lewis’ village was the sixth, thus its designation as Wigwam Village #6. Fifteen concrete and steel freestanding teepees are arranged in a semi-circle around the main office. The motel office and its surrounding small buildings represent the quarters of the chief and his family. Each teepee is 21 feet wide at the base and 28 feet high. The teepees are painted white with a red zigzag above the doorway. Rooms feature the original hand-made hickory furniture, and each is equipped with a sink, toilet, and shower. Vintage automobiles are permanently parked throughout the property, including a Studebaker that belonged to Mr. Lewis. In front of the main office were gas pumps that are no longer in place. Mr. Lewis successfully operated the motel until Interstate 40 bypassed downtown Holbrook in the late-1970s. Mr. Lewis sold the business, and it remained open, but only to sell gas. Two years after Mr. Lewis’ death, his wife and grown children re-purchased the property and reopened the motel in 1988. They removed the gas pumps and converted part of the main office into a museum, which is open to the public. The museum holds Mr. Lewis’ own collection of Indian artifacts, Civil War memorabilia, Route 66 collectibles, and a petrified wood collection. Wigwam Village Motel #6 was listed in the National Register of Historic Places in 2002. 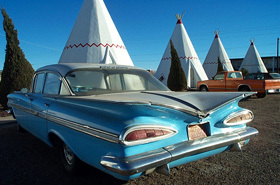 In 2003 and 2007, the motel received Cost-Share Grants from the NPS Route 66 Corridor Preservation Program. Of the seven original Wigwam Village Motels, two other Wigwam Village Motels survive: #2 in Cave City, Kentucky and #7 in Rialto/San Bernardino, California. Wigwam Village Motel #6 is located at 811 West Hopi Dr. in Holbrook, AZ. 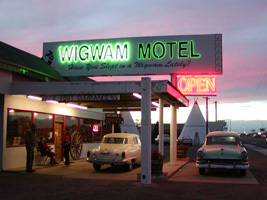 For reservations contact 928-524-3048 or visit the Wigwam Motel website. Each teepee has a private bathroom with toilet and shower, a television, and air conditioner. Keeping with the authenticity of the original motel, there is no ice machine, but if requested, staff will fill a small ice bucket for customers.